As winter comes to an end, step outside with Treasure Trails this February Half Term (16th – 24th February). Will you crack the codes on a Spy Mission, become a detective with a Murder Mystery or find ‘X marks the spot’ on a Treasure Hunt? There are over 1,200 Trails to choose from across the UK. From exploring urban cities to quaint, chocolate box villages and dramatic coastlines to fairy-tale woodland, Trailers will uncover the secrets of our country’s most scenic locations. Treasure Trail booklets cost £6.99 (plus P&P if required), are suitable for groups of up to five and are designed to appeal to anyone with a sense of adventure; from young detectives and budding spies to adults who never grew up. Lasting around two hours, the aim is to solve clues on a circular route of approximately two miles incorporating plaques, signs, statues, monuments, images, engravings or any other unique or eye-catching features. 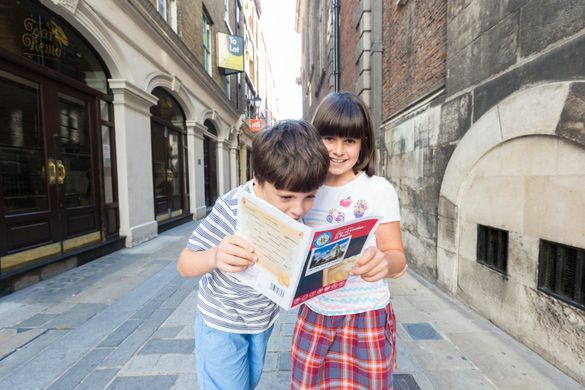 Budding detectives will need to work together on this murder mystery Trail surrounding Seven Dials and Covent Garden. Time is ticking on this Treasure Trail spy mission. Weave through the heart of St Albans and pass through historic inns, the ‘Abbey’ and learn about other local landmarks. Follow the journey of a Scottish nobleman rumoured to be involved in piracy on this treasure hunt. Twist and turn through the ancient streets of Edinburgh as you and your family try to locate the hidden treasure. Explore the Manchester Medieval Quarter with this murder mystery and discover the secrets of this ancient city. Discover the King’s Mile and hunt for treasure on this Trail as you explore the historic east side of the city inside and outside the walls. Crack the code on this spy mission uncovering the secrets of the Bath Abbey and 18th Century Georgian architecture. Calling all sweet-toothed detectives! Solve the whodunit murder mystery trail whilst exploring the picturesque ‘chocolate-box streets’ unwrapping the mysteries behind Terry’s, Rowntree and other kings of confectionary. Weave through the ‘city of dreaming spires’ and see the heart of this ancient city on a spy mission Trail. Climb the 99 steps to the top of the Carfax Tower, see where JRR Tolkien used to live and learn many more amazing stories. Discover the culprit on this murder mystery whilst you explore the Georgian heart of this lively county town and it’s beautiful parks and riversides. Adventurers will love this treasure hunt Trail in the centre of Cambridge. Search high and low throughout the high street and university colleges for stories and clues.